Warner Bros. unveils the official banners for the highly anticipated “Harry Potter and the Half-Blood Prince,” due to open across the Philippines on July 16, with a first-look feature here at http://glamourmoments.blogspot.com/. 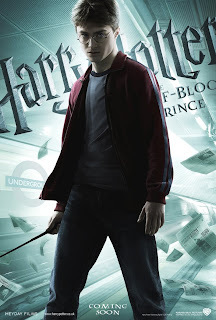 The banners highlight six characters that major prominently in the sixth installment of the blockbuster series: Harry, Ron, Hermione, Dumbledore, Voldemort and Snape. In “Harry Potter and the Half-Blood Prince,” Voldemort is tightening his grip on both the Muggle and wizarding worlds and Hogwarts is no longer the safe haven it once was. Harry suspects that dangers may even lie within the castle, but Dumbledore is more intent upon preparing him for the final battle that he knows is fast approaching. Meanwhile, the students are under attack from a very different adversary as teenage hormones rage across the ramparts. Love is in the air, but tragedy lies ahead and Hogwarts may never be the same again. Warner Bros. Pictures presents a Heyday Films production, “Harry Potter and the Half-Blood Prince.” David Yates, who directed last year’s summer blockbuster “Harry Potter and the Order of the Phoenix,” returns to direct “Harry Potter and the Half-Blood Prince.” David Heyman and David Barron are the producers, with Lionel Wigram serving as executive producer. Steve Kloves wrote the screenplay, based on the book by J.K. Rowling.